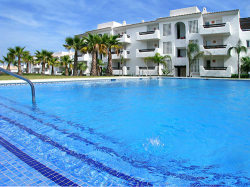 VILLAS TO RENT IN SAN PEDRO, SPAIN. Welcome to our selection of holiday villas to rent in San Pedro, Spain. San Pedro de Alcantara is an old agricultural town that alike many towns and villages in Spain were either chosen by developers to attract tourism or made the choice itself to attract tourism. San Pedro, as it is more commonly known, chose the latter and unsurprisingly due to its close proximity to other more established resorts such as Puerto Banus and Marbella it is proving more and more popular with every passing year. The beach also provides water sports such as jet skiing and pedaloes. They also hire out sun beds, provide showers and play areas for the children. If there is need of any other type of water sport, the close proximity to Puerto Banus and Marbella will provide it all as well as instruction and equipment for hire. Looking for self catering holiday accommodation in San Pedro? Then below is a selection of holiday villas in San Pedro that can be rented direct from their owners. You can either click on each listing for further details or you can use our search engine on the left if you are looking for something in particular.